Will Girls 2019 Pole Vault Live Up To Standards Of Past? 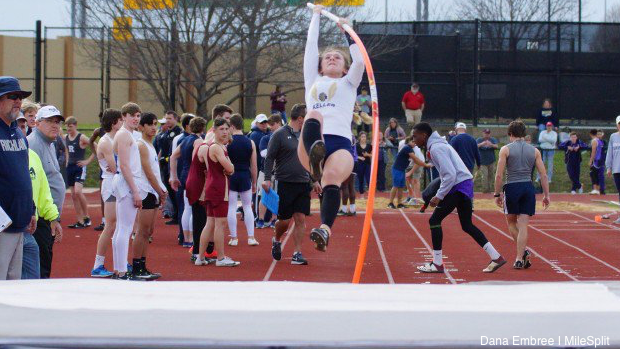 In 2014, the Texas girls pole vault season was about as good as it gets. It was actually about as unrealistic of expectations as you can get for the event. That year, there were 12 girls to jump 13-0 or better. That is the definition of quality and quantity. Even more impressively, six girls were at 13-2 and three of the girls were 13-6 and higher, led by Justin Northwest super star Desiree Freier, who led the 2014 girls with several 14-0 plus jumps. Now, to some, these numbers may not mean much, but trust me those heights aren't frequent in high school and to have that many is very impressive. From there, the standard had been set and the performances have been consistently impressive. In 2015, the girls pole vault continued to see high jumps. It was the same for 2016, 2017, and 2018 as the amount of 13 feet and over jumps had grown to an average of 7.4 each year. The 2018 season was another outstanding season for the girls pole vault. It was another high volume year where 10 girls jumped 13-0 and over with two girls going 14-0 in New Caney senior Nastassja Campbell and Marcus junior Mackenzie Hayward. So, how is 2019 going? Will it match up to the standard set by the recent past? It is only March 24th, and about six to seven weeks into the season and about five to six weeks remaining. The 2019 season is right on par with last year. Just past halfway through the season, there are already five girls at 13-0 or better and one more just beneath at 12-10. There are already half as many 13 footers this season as there were last year and seven less than 2014. Wolfforth Frenship senior Sarah Tackitt has a 12-10 jump on the season, which is just three inches away from reaches the 13-0 barrier. Tackitt is having a great season as she has now jumped over her PR from last year in each meet this season and has progressively improved each meet. There are also two girls who jumped 13 feet last year who have yet to do it this year. The 2019 girls pole vault season is just getting started!